Keep 'Back Foot Sideways' Like Robinson Cano? I like how he presets his arms… you know I’m all about pre-setting….I really like how he thinks of the shoulder ceiling and not really the bat path….That is big time… Obviously compression is a great term… Many great things…. Great stuff. Any idea what type of bat he is using. Love the idea of a lighter bat for BP work. Thanks Joey! Bob, he calls them Ninja Bats and for the life of me I can’t find them on Amazon or on his page. I’ll have to ask. At the 21 minute mark he tells the kid not to move backwards. Does this mean when “showing numbers” you are back far enough? I wasn’t sure what he meant. Also, what does he mean technique wise when he says compress the ball and swing hard? Is that allowing for the back foot to skip forward for more Force? Jonathon, great question. He did this video back in 2013, so he had zero knowledge of my system (we officially met in 2015 I believe). Now I don’t agree with cutting out the back motion because that is essential to all human movement, while changing directions. To be clear, you can ‘show numbers’ before the swing even starts. You don’t have to move into that movement, you can start in it. The power in using “compress the ball” cue is it’s an external one. Lumberjacks in competitions don’t think about the mechanics of an “ax swing”, they’re thinking about burying the blade into the wood. In my opinion, compress the ball is to lean the hitters weight into impact and compress the ball with the bat like a pancake, or like I say drill the head of the nail (ball) flush into the wall. Matt is talking about directional force here, this is so important. 8000-lbs of force per square inch in one direction, is what it takes to hit a ball 400-feet. The keyword there is “in one direction”. So what does than mean? For me, there is a pointing of the lead arm and a pressing in the rear arm or elbow that goes through… And a first feeling that should feel like you are pushing your hands together and at a moment later a 2nd feeling by taking all that energy and pushing your energy in opposite positions on top off each other…And while this is happening, the batter ought to feel the body, particularly the trunk, get tighter and tighter… And this energy is taken right to the ball…. So compression is seen from the external and you match that with a feeling that is internal and transferred to the ball… So when I say “go to the ball” I added at some point and take your energy to the ball and compress it…. I’ve tried… hold your breath before you go to the ball… but now I’m opening a can here as this gets complicated… But what I like is the feeling that the batter is transferring his energy to the ball… if I think of transferring my energy to the ball it’s easy for me to get directional…. Also, being a Yankees fan I remember Nokes well… he approaches the ball well… But his coil was not completely tighten meaning his alignment could not have been in the most powerful position which was obvious because if he had that tight of a coil with his approach to the ball he would have been unstoppable in my view…. “Full linear momentum”… can you explain that to me a little bit more….Are you talking about the multiple transferring of energy??? Joey, Some of this seems contrary to your system. Could you point some things you differ on? Hey Jim, what are you seeing that’s contradictory? Ok… I think the reason I don’t like the phrase stop and quit is it’s talking about 3-dimension move but putting it in terms of 1-dimension…. And this now even goes into the other comment I had in another article… regarding breathing and holding your breath… At some point you have to firm up and it LEADS to a holding of ones breath to a certain extent but it’s not like it exactly…So firming up is like bracing but yet again it depends on how we want to define these things as some of these things are preset in order to get the tightest coil possible which gives the batter full connection and more importantly let’s our nerves get engaged in the right way which leads to the right movements without resistance…And at the end it all ties together with your pelvic floor… I believe I once told you that if you hold your pee you may get what I’m saying…. Why is his upper half coming over his front leg – a linear Charley Lau/Walt Hriniak approach? Also, notice the angle of his back leg. Shouldn’t it be at a 90 degree angle. He appears to lunging. The difference between Brandon’s initial swings and those at the end are noticeable. 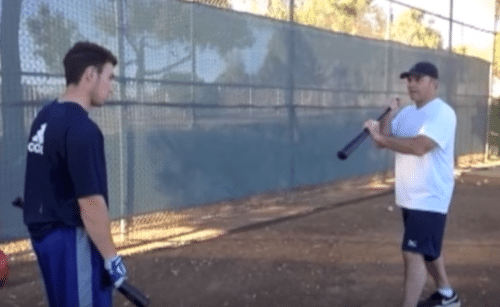 At the beginning of the video, Brandon was striding into the plate (more than the Xenolink recommended 10 degrees), looking out over the plate, barring his front arm to compensate, and hitting around the ball a bit. At the end of the tape, Brandon was striding straight ahead, his head position was more forward looking, and he wasn’t barring his front arm. But Matt didn’t address any of those issues. Brandon’s upper half did not come over his front leg, though Matt’s upper half came over his own front leg in every one of his demonstrations. Let me say it differently, the grip is not just slapped on the handle… It’s placed on the handle in a very specific way for a reason… Same with the forearms and the upper arms…Meaning our upper limbs are held with forces built in… Built in to our trunk and also just built in with our hands…Everyone is looking to make it LOOK the part but it should FEEL the part….And that FEEL is what gives our grip and our arms something BUILT IN…. So if locked his arm barred and just brought the handle up he …………………..
Joey… feel free to comment ? By the way, anybody reading this… Am I losing everyone… or am I lost….